The Constitution, along with the Judges (Inquiry) Act, 1968 and the Judges (Inquiry) Rules, 1969, provides for the entire process of Impeachment. The Article 124(4) of the Constitution says: A Judge of the Supreme Court shall not be removed from his office except by an order of the President passed after an address by each House of Parliament supported by a majority of the total membership of that House and by a majority of not less than two-thirds of the members of that House present and voting has been presented to the President in the same session for such removal on the ground of proved misbehaviour incapacity. Step 1: A notice of motion is issued by 100 MPs from the Lok Sabha or 50 MPs from the Rajya Sabha. This motion for removal can be moved in either House. Step 2: The motion can either be accepted or rejected by the Speaker/Chairman of the House. If the motion is admitted, the Speaker or the Chairman of the House forms a three-member committee comprising a senior judge of the Supreme Court, a judge of the High Court and a distinguished jurist to investigate the charges. 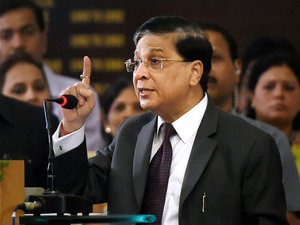 This committee would look into the alleged charges levelled against the Chief Justice of India. Step 3: If the three-member committee decides to support the motion, it is taken up for discussion in the House, where it had been introduced and must be passed by a special majority which means it has to be supported by a majority of the total membership of that House not less than two-thirds of the members of that House present and voting. Step 4: Once it is passed, it is taken up in the next House where again it needs to be passed by a special majority. Step 5: After the motion is passed through both the Houses with two-third majority, the President of India is approached to remove the Chief Justice of India.